North Devon Tarka Girls and Ladies We welcome all girls and women to just come along to sessions and learn to play cricket or improve their skills with the aid of as many qualified coaches as we can find, in a great fun atmosphere. For those who already play at a club, Tarka Girls and Ladies complements the mixed cricket girls can play in their own clubs and allows them to come together to have fun and play all girls cricket. This initiative allows girls to enter The Lady Taverner’s Competitions and participate in other all girls and ladies’ competitions and matches. We play friendly all girl cricket; the Tarka team is made up of girls from any club in North Devon getting together. The cricket takes place on Thursday evenings, whether training sessions or friendly matches (as agreed at the NDYCA AGM, the aim is to play Tarka matches on Thursdays so the girls are available for all other club matches for which they are selected). We will use these sessions to prepare for the national Lady Taverners Competitions (we were national u15 champions in 2015). We are totally committed to ensuring the safety of the girls and their enjoyment of the game. Matches against boys teams are managed carefully to facilitate the most enjoyable cricket for all parties. 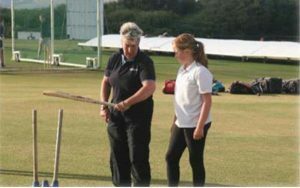 Clearly, it is good for the girls to play mixed cricket and the clubs in North Devon are blessed with many committed and gifted coaches who endeavour to make good provision for all their players regardless of gender. Nevertheless, the benefits to the girls of playing in an ‘all girls’ team are obvious and complement the girls’ involvement in their local clubs. The Tarka Ladies Team, made up of girls aged 12 and above who are confident enough to play adult cricket, train on a Wednesday evening. The Tarka Ladies have enjoyed outstanding success winning the Devon Womens League for each of the last three years. The backbone of the Tarka Ladies is made up of the U15 Tarka Girls that won the won the National Lady Taverner’s Club Hardball Final in 2015. NDCC provides a fabulous wicket for us to play on and score runs. Tarka Ladies are lucky enough to be coached by Mark Overton, father of two England Cricketers. Not only do we play cricket together, we ‘play’ together. This year we had a rather damp T20 at the club with a BBQ and sleepover and quiz followed by a T20 the next day. Helen Overton was the Queen of the quiz much to the delight of the girls and we even had some of the first men’s team players joining in too! This builds great camaraderie and team and club spirit. 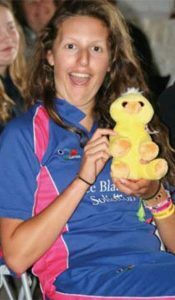 The 2017 season was going to be challenging as Lydia Clements was picked to play for Wales and had an outstanding season for them, limiting her availability for Tarka Ladies. 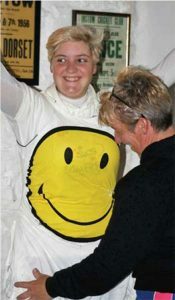 Alli Kelly, who has been a phenomenal role model and run scorer for us, was largely unavailable, so for our youngsters and a few very Golden Oldies, including myself and a less old but more golden, Ana Clements, the game was on! 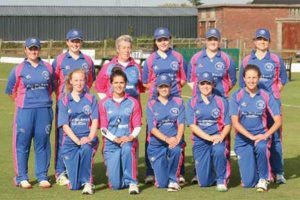 Plympton Ladies dropped down into the Devon Womens League from the South West League and include in their team the overseas players who have come to play for the Devon Ladies County side for the summer. After losing to them at home, we travelled to Plympton for our most challenging fixture of the season and delivered a thrilling performance to win by one run in the last over of the match scoring 112 for 8!!. For us, there is no I in team. We know we really need the cricketing genius and inspiration that is Mark Overton. We are lucky to have the calm and wise support of Mark Davies and scoring skills of Michael Ball, as well as the terrific group of Tarka supporters. I am honoured to get a chance to play matches with these ladies and secretly chuffed when someone has to come off for a bit so I can sneak on and be involved at the coal face. I cannot tell you how great it feels, never having played a cricket match until I was over 50, to step out on to the ground at Instow and be part of a team. At last, despite being involved in sport at a relatively high level as participant when I was younger, as a manager and coach since, I really understood the special buzz that is cricket and the magic that is NDCC! At Tarka Ladies everyone plays their part. The openers are aware they would not be playing without the lower order and we are all very supportive of one another. We have great run scorers, most notably Lydia and Carmen Clements, Rose Ball and Kate Williams, great bowlers in Ellie Holland, Eluned Davies and Lauren Bowden. A brave wicket keeper in Charlotte Lipscombe, fabulous up and coming youngsters Flora Corbin, Olivia Kingdom, Evie Huxtable, Molly Down and Grace Heard. Our terrific all-rounder Ana Clements and a wise and generous Captain in Lauren Bowden. Thank you especially to all those here who turned out for almost every game. I am not going through blow-by-blow accounts of matches won and lost. We had lots of fantastic highs and some lows too. At Axminster lack of availability of our players and a difficult atmosphere, coupled with some dodgy decisions, led to a humiliating defeat from which we showed great strength of character to bounce back. The season had many more high points; victory at Plymouth by one run, scoring 244 in 35 overs against Cornwood, even on Andrew Cameron’s delicious wicket, that score is no mean feat and demonstrates that ladies can bat, and bat well. In the Devon Womens League we played 10, won 6, lost 2, with 1 abandoned and 1 cancelled. 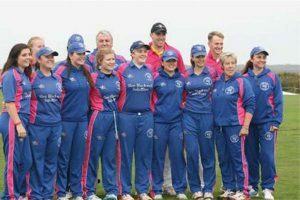 For the third consecutive year, North Devon Tarka Ladies were Devon champions. The pinnacle of the year was when we were invited to be part of the fantastic Hildreth Benefit T20 day at Instow. With a few ringers in tow, a couple of them over 6 foot 5, we managed to have all Overton’s 11 girls and his two sons on the pitch simultaneously and my favourite fielder of all time, Max Waller; – what a great day and a fantastic end to the season. Thanks to the players, their parents and supporters (especially Harley! 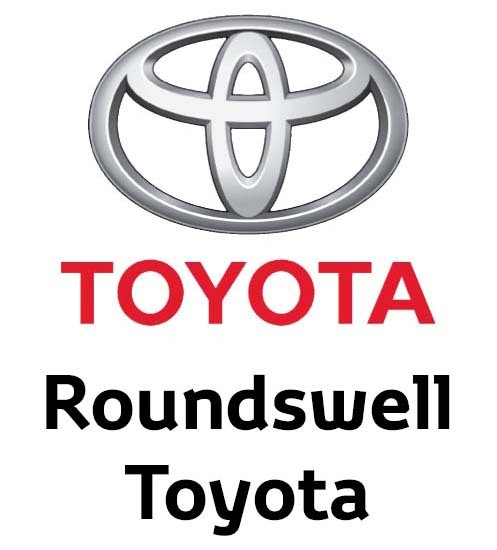 ), the groundsman, the Chairman Mark Ansell and last but by no means least the ladies and girls coach, Mark Overton.